Phil Rowley, At the age of 6 Phil Rowley was introduced to coarse fishing in England and has been hooked ever since. 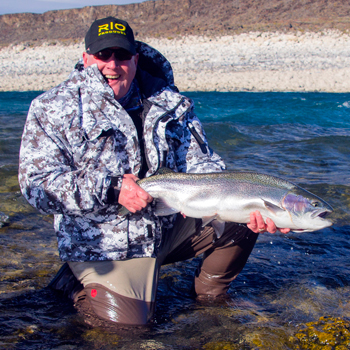 For over 20 years Phil Rowley has been fly-fishing stillwaters almost exclusively. His love of stillwater fly fishing has taken him all over British Columbia and Washington in the pursuit of trout and char. A former commercial fly tyer Phil has written for almost every major fly fishing publication in North America. Phil Rowley goes beyond basic strike indicator chironomid techniques and explores techniques and setups for deep water indicator fishing, the dry line long leader technique better known as the naked technique, and sinking lines including 'dangling' where we fish straight up below the boat - the takes with dangling are heart stopping! His contributions also include books and numerous feature articles 2 regular columns on fly-fishing with particular attention towards stillwaters and stillwater fly patterns. Phil's book Fly Patterns for Stillwaters is a best seller. As a compliment to Fly Patterns for Stillwaters Phil’s released his latest book Stillwater Selections. Phil has a number of tying DVDs including Tying Flies for Stillwaters, Tying and Fishing Stillwater Flies and Learning with the Pros Stillwater Fly Tying Volume 1 with long-time friend Brian Chan. Phil and Brian have also recently released the first in a three-part DVD series detailing how to fish chironomids entitled, Conquering Chironomids Volume 1. When he is not tying flies or on the water Phil travels western North America performing at outdoor shows, teaching a variety of seminars, speaking to fly clubs and conducting weekend fly-fishing schools. In addition to Phil's shows and seminars, he has had the good fortune to appear on such T.V. shows as Sport Fishing B.C., Fishing Alberta, The New Fly Fisher and Fishing with Shelly and Courtney. Recently Phil became one of the co-hosts of the New Fly Fisher, a television production dedicated to fly fisher education. Phil's website, www.FlyCraftAngling.com is dedicated to fly-fishing and fly tying education. Featuring tips, techniques and streaming video this comprehensive site is constantly changing to meet the needs of its members. In 2012 Phil, along with Brian Chan, opened an online store offering a variety of products specifically aimed at the challenges of fly fishing lakes, www.stillwaterflyfishingstore.com. Stillwater enthusiasts now have access to Phil and Brian’s autographed books, DVDs, Quick Release Indicators and a comprehensive selection of stillwater flies. These are products you will find in Phil and Brian’s kit bags, at their fly tying stations and perhaps most important, in use on lakes they fish across North America. When he is not focused upon fly-fishing Phil spends time will his wife Patsy and their two active sons, Brandon and Sean. The entire family enjoys the outdoors and fly-fishing in particular. It is common for Phil's travels to include his family on his speaking engagements and fishing trips.